Cranleigh riders had a busy start to the half term break with four days of competition at the NSEA National Schools Championships at Keysoe Equestrian Centre in Bedfordshire. 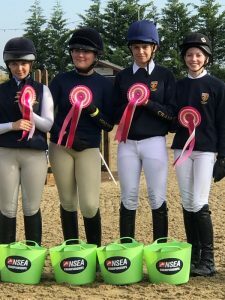 Riders from schools across England, Scotland and Wales had qualified through regional competitions to contest the championship classes, both as teams and individuals, with over 40 school teams competing in the majority of classes. To make the final line-up, teams or individuals had to finish in the top eight from the long list of starters. Cranleigh was well represented once again but riding is a precarious sport where the merest touch of a pole can make the difference between gold and nothing. In the dressage arena less than one mark can make the difference, and once again the top six teams all finished within one percent of each other once the scores of their three best riders had been added together. It was therefore an excellent performance by the Cranleigh team, consisting of Josh, Daisy, Lulu and Darcey-Blaze (who is still only in Form 3 of Prep School) as they finished in fifth place, just 0.64 percent behind the winning team. Josh Moore, a former CPS pupil, went on to be crowned National Individual Elementary Dressage Champion, taking the title by over one and a half percent. He also took the silver medal, and finished fourth with his second ride, in the Novice Championship, whilst Lila Millard finished eighth in the Prelim Championship. Josh was also in the English Schools Nations Cup dressage team who were victorious against the Scottish, Welsh, Irish and the United Nations teams. Further success came in the Arena Eventing (Jumping with Style) championships, with the novice team of Scarlett, Annabel, Issy and Lulu taking fifth spot, whilst our Open Team of Josh, Issy, Darcy, Zander and Lila took fourth spot, within a whisper of the medal positions. Josh was also fourth individually in this Open class, whilst Lila came an impressive fourth in the Advanced Open Individual. A particular mention to Cranleigh Prep pupils Rory S, Madeline R and Lucy L-M who also competed in various championship classes. Plenty for the Cranleigh riders to build on as they head into winter and attempt to retain their Surrey County titles!